, landing the online marketplace as one of its foundation clients. In the 30-second ads, Warne reflects on his recent purchases with regret, including an expensive pair of headphones and a juicer. As a cricketing legend who has made some embarrassing mishaps and headlines in his day, eBay paired up with Warne to make sure Australians avoided the same mistakes and explored the site for cheaper options. Recently appointed CMO, Julie Nestor, says the new campaign doesn’t shy away from Australia’s unique sense of humour. “We’ve created a campaign that reflects the strength of our Australian business, without taking ourselves too seriously," she says. "Collaborating with Warnie has given us the perfect opportunity to remind Aussies of this strength, and have some fun along the way." It's the first work released since Nestor's appointed was announced in March, leaving her post at Amex. She replaced Tim MacKinnon who stepped up the role of managing director. In September last year, 72andSunny revealed its first work for eBay, which was an Australian iteration to a global platform, taking aim at Amazon. 72andSunny was recently appointed to the Optus roster and is focused on producing more local work as it approaches its first full year in the Australian market. 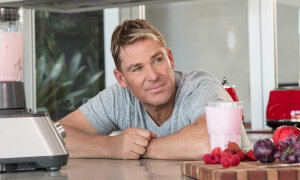 Former Aussie cricketer Shane Warne is the star of eBay's latest ad campaign from 72andSunny. The ad is the second produced by 72andSunny for eBay since the creative agency opened in Australia last year, landing the online marketplace as one of its foundation clients.